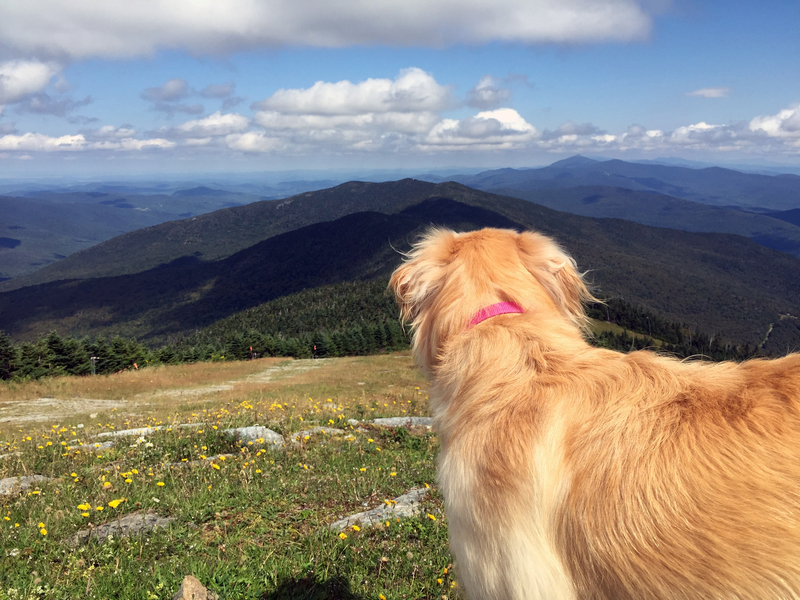 Lucy takes in the view atop Mt. Ellen. Fayston, Vermont. In last week’s post, I outlined how we planned to celebrate National Dog Day. I had to put that ambitious itinerary in writing, so I needed to follow it. However, the boys Linus and Charlie Brown accompanied “Dad” to trail work, leaving Lucy as my hiking, swimming, creemee sharing, grooming, and napping companion. Lucy and I hiked to the summit of Mt. Ellen, took a different way down that featured a thicket of thorns, then Lucy cooled off in the pond as I pulled nature from my shins and arms. We had barely settled on the couch for our nap when the boys arrived back home after a long day on the trail. I took a few photos of our day, except that we were both quite sticky as we enjoyed the creemee so no photos of that part. Although every day is a dog day in our house, the designated day provided a really good excuse to channel Ferris by ignoring my schedule and “have to’s” and enjoy a beautiful summer day with my best girlfriend. We need more days like this!